Folks in upstate NY have been engaging in a long-term campaign of civil disobedience in resistance to drone warfare. Below is the reported testimony at Mark Coleville’s trial as reported on http://upstatedroneaction.org. Mark Colville, a Catholic Worker from New Haven, Connecticut, was tried on September 18 and 19 on five charges stemming from a peaceful, nonviolent protest at Hancock Air National Guard Base, which is a drone control site located outside Syracuse, New York. His Sentencing Hearing is coming up on December 3. Mark, who faced the court pro-se (presenting his own defense rather than having an attorney do it) was tried in DeWitt Town Court before a jury of 6 persons, with Judge Robert Jokl presiding. Mark was charged with 3 Violations: Trespass and 2 counts of Disorderly Conduct; and 2 Misdemeanors: Obstructing Governmental Administration and Contempt of a Court Order. Judge Jokl did not allow anyone to record anything in the courtroom. Normally, though the judges don’t allow recording testimony, we have been allowed to record opening statements and closing arguments. Since this was not the case, I took notes during the trial which I will present below. I stand before you as the conscience of the community. Why do I have all these charges? Five significant charges against a guy who walked prayerfully to the Guard Gate (of Hancock National Guard Base) with flowers. Intent is key to this case. Mark says that he is proud of his actions. I brought flowers and a request from an Afghan youth who had lost friends and a family member to a drone strike, for an order of protection for his community, a request for protection from random instances where death arrives from the sky. Mark holds up a document. As he speaks of the request for protection, Ellen, who is sitting at the table in front of the courtroom, holds up a photo of Raz Mohammad, the young man who wrote it. The Judge objects. He says the letter is ‘hearsay’. Mark goes on to ask, why he is charged with both Trespass and Disorderly Conduct when one charge is necessarily related to actions in relation to private property, and the other in relation to the public domain. Mark says that it wasn’t his intent to violate the Order of Protection, though he was successful in doing so. Why was he there? He was required by his ministry to go to the gate of Hancock Base because crimes are being committed there and he has first hand knowledge of the victims – he knows some of them personally. The so called Government Administration that he is accused of obstructing,was not approved by the people. The drone program was imposed on us without our consent. There is only one way that misdemeanor can get to a ‘Guilty’ verdict. That is if the prosecutor impropperly succeeds in shifting your conscience community. Mark says that his actions have been incorrectly presented in the context of three people on a whim to be disruptive. But their intent goes much deeper than that. Consider the evidence, all the evidence. I have been engaged all my life in a ministry of direct engagement with the poor, including extensive missions overseas and to the Middle East. The victims of our violence must be defended. I, as an American citizen, have a particular responsibility to defend those people. Mark finished his Opening Remarks with two quotes. The first is from the Tokyo War Crimes Tribunal. Mark pointed out that The doctrine of preventative war was rejected at Nuremberg as well. 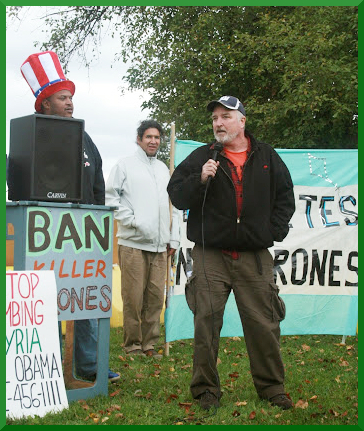 You can see continued coverage of the resistance movement against drones in upstate New York on their blog http://upstatedroneaction.org. Radicaldiscipleship.net would like to highlight ongoing civil disobedience around the country. Please send us updates of your campaigns to lydiaiwk@gmail.com or tommyairey@hotmail.com. This entry was posted in Just Peacemaking and tagged civil disobedience, Drones, Mark Coleville. Bookmark the permalink.